Channeling my inner Douglas Adams, this is part 4 in my 3 part series on the debt. Most of this post has appeared in various places elsewhere in this blog. Think of this one as a summary. We have raised our debt limit over 100 times since it’s inception. There have been a few battles over raising it, but nothing like what we’re seeing this year. And we’ve never had the credit agencies breathing down our neck like this before. So, why are we hearing so much about credit agencies lowering our credit rating? What’s got them in a tizzy? There are two things that make this time different. The first is our current debt level. As I type this, it is 98.14% of our GDP, according to USDebtClock.Org. That’s the 12th highest in the world. It’s also the largest in the world, in terms of actual dollars. In fact, it’s almost 25% of the world GDP. 98% is exceptionally bad. As I’m sure you’ve heard, it’s only been that high once before in the country’s history, and that was right after WWII. However, that number was so large because of our enormous investment in defense during WWII. Once we cut defense spending to reasonable levels, it was not that hard to bring our debt levels down to manageable levels. But as the figure below shows (h/t The Foundry), in terms of GDP, the defense budget now is already at near historic lows. We won’t be able to handle the debt crisis merely by cutting defense. The only way we can keep the size of our interest payments down is to keep the size of our debt down. So, really the problem is entitlements spending vs. revenue. We’re going to have to bring down costs or “increase revenue” as you’ve heard. Actually, the problem isn’t an “or”. We have to do both, as I will show. Now, I define “increase revenue” correctly. When I say that, I mean that the IRS needs to bring in more revenue. There are a number of ways that can happen, but the easiest way is to grow the economy. Think of it as fishing. You just need to cast a bigger net. The liberal plan is to make the holes in the net smaller or to keep casting the net over and over in the same place (eliminate loopholes, raise taxes on those already paying). Both of those might work, but they aren’t going to work as well as using a bigger net. The reason that Speaker of the House John Boehner (R-OH-08) lost his patience with President Barack Obama (D-USA) is over this very issue. The Democrats and the President have put various long term budget frameworks out for review over the last few months. I’ve reviewed some of them earlier. The others are more of the same. But none of them do much in the way of entitlement reform. This is the same problem with the Gang of Six plan that was released this week. And, if we’re to believe the rumors and leaks from the debt talks, that’s been true of every idea that’s come from the White House. All of the plans we’ve heard primarily try to solve our long term issues from increasing tax revenue. So, the second reason the credit agencies are breathing down our neck is the number 20.9. That number represents the highest tax revenue as percentage of GDP that we’ve ever had. In fact, William Kurt Hauser, economist, suggests that no matter what we do to the tax code, the best we can really do is 19.5% over any kind of extended period (actually, the average from 1946-2007 was even lower, 17.9%). This is known as Hauser’s law. The obvious effect of this is that if you know you’re going to end up with about 18-19% GDP for tax revenue, and you want more revenue, you’re going to have to increase GDP. This is basic and simple math. Something apparently beyond the capability of most liberals. But anyway, the best ever was 20.9%. I admit, I’m not totally sold on Hauser’s law. I believe that it might be possible to have tax revenues exceed 21% of GDP. In fact, it seems likely that one way to get there would be to continue to shrink GDP. That would not be a desirable way, however. Every single plan suggested by the Democrats or left leaning think tank that I have seen has revenue goals exceeding 23%. From now on. Some exceed 24%. I’ve seen one that was very close to 25% for the majority of its lifecycle. So, here’s the thing. I’m not stating that it’s impossible to exceed 20.9% (many do, in fact, say that, but I’m willing to keep an open mind). But I am stating unequivocally that it’s insane to expect exceed 20.9% for any kind of extended period, when we never have. The credit agencies aren’t stupid. They see our debt forecasts. They see the revenue forecasts. They know Hauser’s law, and they know that it’s always been true. They know the revenue forecasts are wrong. They know the debt is going to be worse than forecast. Any plan from our government that projects revenues at greater than 20.9% (and probably even a good 2 points less than that) is going to be summarily rejected by Moody’s and S&P. 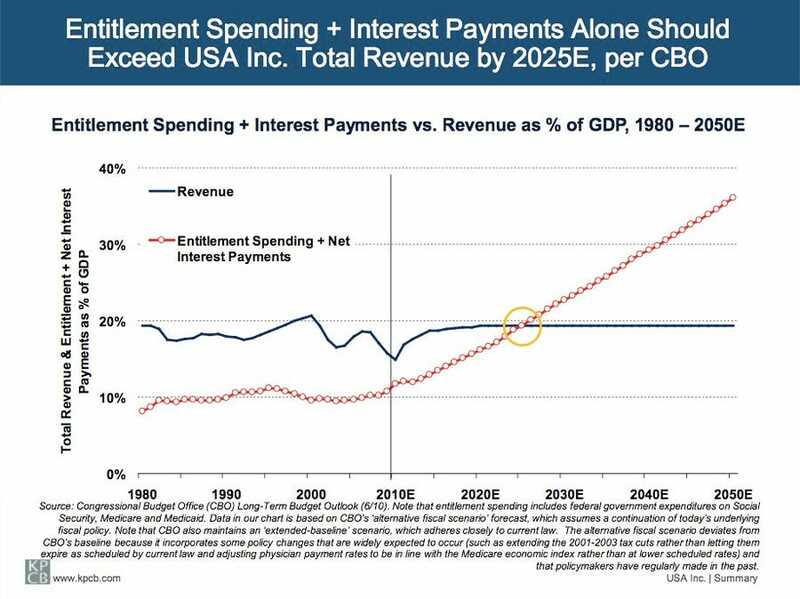 It shows that by 2050, all of available tax revenue will be going to pay for entitlements. This comes from the CBO, and has somewhat optimistic economic growth assumptions. The credit agencies have charts like this one too. And they know that these economic growth assumptions are optimistic. So, not only do they know we’re not likely to have tax revenues exceed 20% of GDP, they know what will happen if we don’t fix our spending when that doesn’t happen. So, like any plan that include insanely optimistic revenue projections, any that include insanely optimistic GDP growth, or any that don’t include entitlement reform, will also be summarily dismissed by the credit agencies. All of the liberal plans suffer from at least one of these problems, usually all three. That’s why it’s different this time. And until everyone involved understands that’s why it’s different, the odds of avoiding a credit rating downgrade don’t look good.